"Signs of the Times: Sign Making in Solidarity" at the Queens Museum. A crowd gathered and symphony of voices responded to the call to action for the J20 Art Strike at the Queens Museum this Friday. The Museum had organized a free community workshop, “Signs of the Times: Sign Making in Solidarity,” so that people could express the changes they want to see and take them to the streets tomorrow in the upcoming marches across the country. Shoestring Press, and Robert Blackburn Printmaking Studio, and other organizations partnered with the museum to make it happen. Assistant curator Sophia Lucas explained that the museum’s staff, many of whom already participate in activism work, wanted to emphasize the museum’s mission to be a safe space for anyone to come and participate in the cultural experience. In alliance with that mission, the museum has now changed their policy regarding membership IDs that come with having a IDNYC. Personal identification information will not be recorded or entered into the museum system to encourage people who feel they may be at risk by releasing their information to come to the museum. 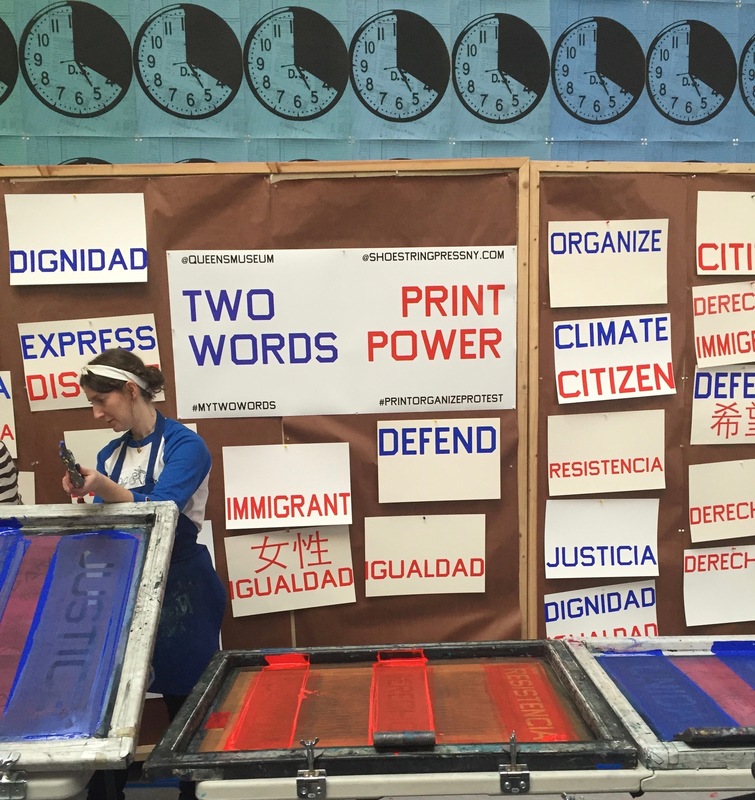 Shoestring Press had already participated in other protest printing events over the past couple of weeks and is active member in Print Organize Protest, which is a network of artists and printers whose mission it is to work together, hosting events for radical social change. Lane Sell, master printmaker at Shoestring Press, summed it up as “a good way to get people to engage with printmaking as a protest medium” – a medium that has proven itself throughout history to be an effective in social and political activism. While making protest buttons I spoke with Michael Pereira, a student at John Jay College, who explained that he attended the event to represent his community and expressed his plans for continuing to have an active role by participating in upcoming protests. Having worked for other cultural institutions and art groups, Jess and I discussed the importance of having institutions participate in the ongoing movements of activism, especially considering what is happening politically in the US, the UK, and all over the world. Jess explained her feelings about the Trump inauguration by stating, “I felt really—this is going to impact the world. This is a world problem, not really (just) America.” Jess also expressed concerns for other international individuals living in America who come from countries already targeted in Donald Trump’s campaign speeches that will cause them to be more heavily scrutinized and marginalized in the upcoming years under the Donald Trump presidency. 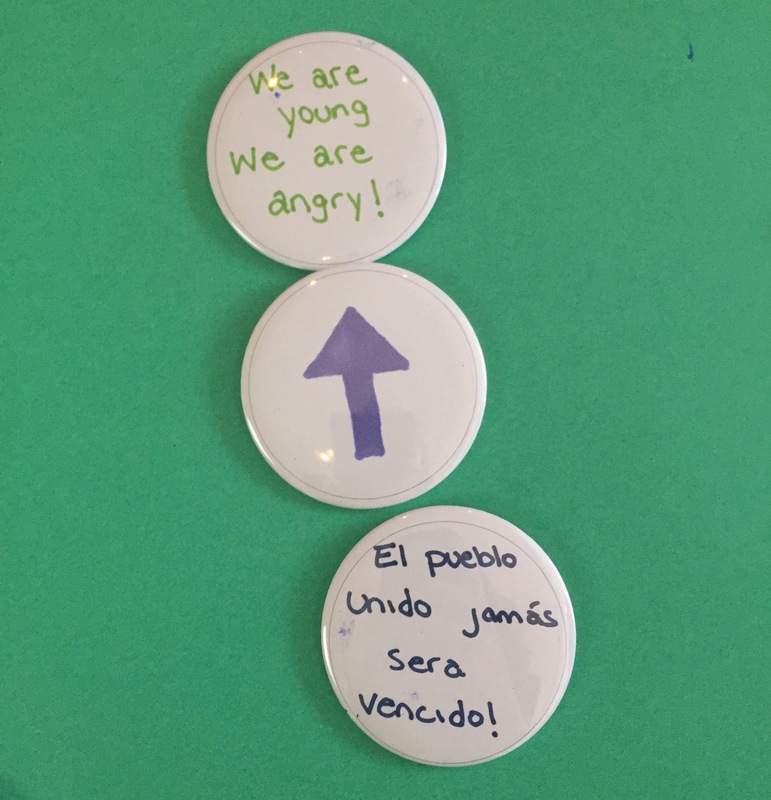 The signs and buttons messages created by the participants at the museum read —Not Afraid—He Will Not Divide Us—Express Change—Women, Power, Justice—Dissent—Empower Women—Climate Citizen—Hate is UnAmerican—Women Defend Justice—Immigrant Citizen—The Future is Female—Anti-Hate—Not My President. It was quite amazing to see a museum full of engaged and participating community members, families, and strong individuals come together to take action against the normalization of the Trump presidency. Lyndsey Walsh is a Biological Artist and NYU grad who studied cultures and representations in media.